Based off the film Thor: Ragnarok comes this Marvel Gallery Thor Ragnarok Valkyrie Statue! This stunning statue accurately captures actress Tessa Thompson as Valkyrie. 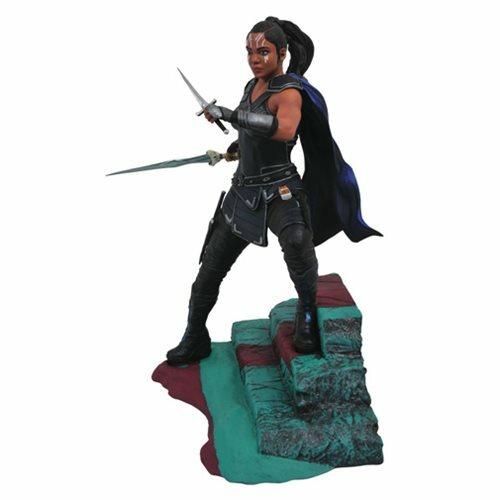 Standing on part of the Grandmaster's planet, Valkyrie measures approximately 12-inches tall and features detailed sculpting by artist Rocco Tartamella. This Marvel Gallery Thor Ragnarok Valkyrie Statue comes packaged in a full-color window box and is in scale to all other Gallery and Femme Fatales figures. Ages 14 and up.